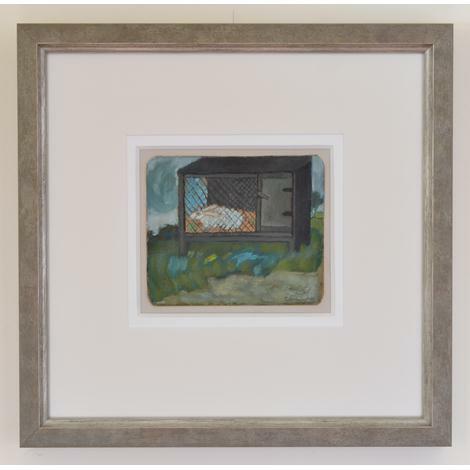 This small and affectionate depiction of a pet rabbit - a white rabbit, with long ears, looking rather longingly through the chicken wire of his cage - was produced by the 'real' Joanna Carringon. The image is painted on a scrap of board which absorbs the oil and leaves the surface soft, dry and matt. This invites close attention to the somewhat sombre harmony of colour. Though this is definitely not by 'Reginald Pepper', there is a gentle, apparently unsophisticated, quality to the picture, evoking an almost child-like attachment to a well-loved pet.